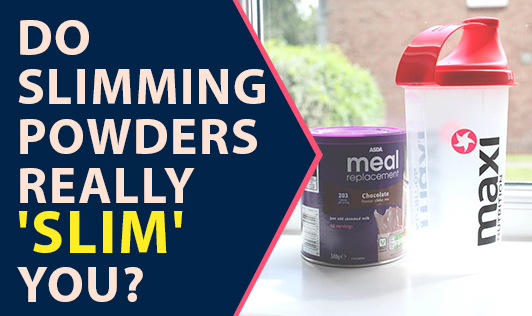 Do slimming powders really 'slim' you? We have a lot of our clients asking about slimming powders which are sold by various companies. There are a lot of companies that promote these so called "Healthy meal replacement" powders for slimming & weight loss. Are they really good for the amount of money that they charge and worth taking? The manufacturers' claims: These products are made out of natural extracts and called herbal or Ayurvedic powders with no side effects, safe to consume, guaranteed weight loss, etc. They are to be taken as meal replacements. About 2 teaspoons of powder is to be taken with low-fat milk as a drink. This gives you the required amounts of nutrients along with calories, fiber etc. and also gives you the satiety. Most of these products give you about 180 - 200kcal per drink. Our opinion: Fine that some of these products might be made out of natural products, but how can the manufacturers say it is safe when some consumers have side effects? Some of our clients have told us about their experiences with these products. They have felt weak and lacked energy. This could be because of the very low calorie intake. They weren't able to do their normal daily routine when they were on these products. How can just a glass of any such beverage give you sufficient energy with required nutrients that you get from a balanced meal, and also give you the satisfaction? When these products give you only about 180-200 kcal how can we call these ‘meal replacements'? Any healthy diet should consist of a minimum of 300 kcal in a meal to provide the required quantity of energy & other nutrients. Well..! This easily explains the drastic weight loss that happens when people are on these products. But what happens when you stop using them? Even though a person is able to follow this pattern and lose weight, for how long can anyone stick to such a routine? Such methods are not really practical and one cannot follow them for long. Once you stop consuming these powders, what happens? Most people gain back the weight they lost. Why? That is because they could not stick to such a routine for long. Also some of these products contain appetite suppressants because of which you do not feel hungry. But when you stop consuming these, your whole system is disturbed and you may tend to eat more than what you used to eat before. There is no need for any such powders/supplements when you can lose weight in a healthy manner by following a well balanced meal plan & some exercise.